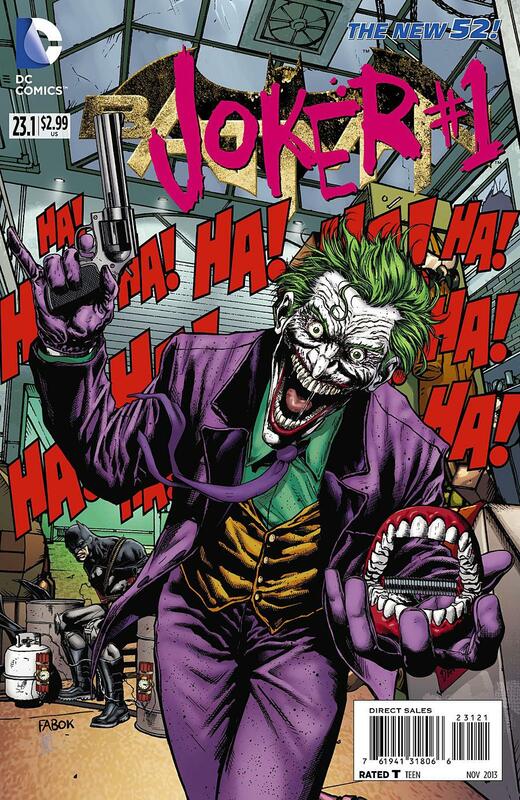 So, my Villain’s Month reading kicked off a couple hours ago with Andy Kubert’s Batman #23.1, featuring The Joker. As I’ve remarked elsewhere, some of these Villain’s Month issues are essential origin issues, or they are continuations of the ongoing Trinity War/Forever Evil event continuity. This particular issue falls somewhere in the middle, since it is a flashback issue set at some point in The Joker’s past, presumably. It barely touches on his origins, and it doesn’t acknowledge the ongoing events in the DC Universe. This made for some interesting, and it was certainly an issue I’d really been looking forward to. However, I was disappointed again and again by this book. And that’s kind of depressing really. When you go for cerebral stories in comics, you better be really good at handling that stuff, like J. Michael Straczynski or Jim Starlin or Gail Simone or Scott Snyder good. That is so not the case here, I’m sorry to say. In a nutshell, my thoughts on this issue boil down to this: this was a terrible issue with some mediocre art, and that’s really it. I really don’t see what exactly writer Andy Kubert was trying to do here. If he was going for the Joker-style whacky here, then he failed spectacularly since there is nothing “good” whacky about the character here. Its all just silliness that makes me frustrated and disillusioned in equal measure. Minor spoiler, but what Kubert tries to do here is to give us some context as to why The Joker is so messed up, and thus we see flashbacks to his childhood. These are contextualised with the narrative in which Joker feeds someone to a big, man-eating snake at the zoo and then the Joker steals a baby Gorilla to raise as his son. My reaction while going through those panels: just what on earth is going on here? I persevered, hoping for some kind of whacky, true-to-Joker pay-off, but that never happened. I was left severely disappointed by the end because it was a non-ending. It did nothing for me and it certainly didn’t have the Joker craziness to it. The only really good Joker stories that have been done, of the ones that I’ve read, are the ones penned by Scott Snyder for the New 52 in the Death of the Family crossover event. Alan Moore’s sophisticated approach in The Killing Joke was far better than this. Even the quirky, goofy approach by Jim Starlin in A Death In The Family was miles better than this. Because really, this was no story at all. It felt incomplete and unnecessary and pointless. The art, with pencils by Andy Clarke and colours by Blond and letters by Jared K. Fletcher was so-so. It was decent stuff. Thing is, the script just drags everything down. I see absolutely no merit in the story and in light of that, the art just doesn’t work for me at all. Not to mention that I really don’t like how Andy draws Joker. Completely different from how Greg Capullo drew him in Batman, or how he was drawn in the other Bat-family books during the Death of the Family crossover. So in effect, the art is just barely serviceable. The Joker is an expressive and emotive character, but that’s not what I was expecting here, especially not given that perfect cover, courtesy Jason Fabok. Bottom-line: this issue is, sadly, a waste of time and money. More Batman: #1-10, #11-12, Annual #1, #13-15, #16-18 , #19-21, Annual #2, #22-23, A Death In The Family, Knightfall Vol.1. Posted on September 4, 2013, in 2013 Reading Challenge, 2013 Writing Challenge, Challenges, Comics Reviews, Review Central and tagged 2013 Reading Challenge, 2013 Writing Challenge, Andy Clarke, Andy Kubert, Batman, Batman #23.1, Blond, Challenges, Comics, Comics Reviews, DC Comics, New 52, Review Central, Reviews, The Joker, Villain's Month. Bookmark the permalink. 15 Comments. Ah. It seems I enjoyed this issue a bit more than you did.